Giuseppe Verdi’s opera Nabucco was livestreamed on YouTube on 30 July 2014 and available to watch on-demand for a limited time afterwards. The opera was presented by Dominic Peckham, who joined Big Screen audiences live from Trafalgar Square in London. For specially selected films and articles about the production download our Nabucco digital programme – for free using the promo code FREENABUCCO. Nabucco, King of Babylon, is at war with the Israelites – but his daughter Fenena is in love with Ismaele, who is one of them. When he captures Jerusalem, Fenena goes against her father and releases his prisoners, leading her vengeful half-sister Abigaille to plot to take power. Nabucco is struck by lightning and in his weakened state is tricked into signing a death warrant for the Israelites by Abigaille. He prays to the God of Israel for forgiveness. But does his awakening come in time to save the Israelites from death? Daniele Abbado’s production is set in the second half of the 20th century and explores the reality of conflict, where friend and enemy may become indistinguishable. 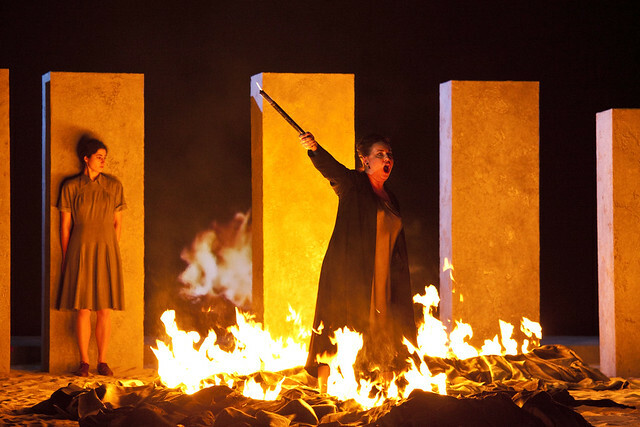 There are wonderful bass and baritone roles in the figures of Nabucco, the Babylonian King and Zaccaria, the Hebrew prophet – while in Abigaille, Verdi created a memorable anti-heroine, at once terrifying and pitiable. Throughout, the score blends rhythmic vitality and powerful drama, and is on a scale to do justice to the opera’s epic themes. An epic drama in every sense of the word, Nabucco features an enormous chorus that sing iconic choral works including ‘Immenso jehova’ and ‘Va pensiero’, the unofficial national anthem of Italy. Find out more about the true story behind ‘Va pensiero’. Domingo sings the title role of Nabucco joined by the Ukrainian soprano Liudmyla Monastyrska as Abigaille, in this first revival of Abbado’s production. In this short film, shot in 2013, the pair discuss the complexities of Verdi’s Biblical epic, a challenge for any singer. Really looking forward to it! Thanks Royal Opera and all involved! Me too! Just been to the rehearsal today and really enjoyed my first experience of this opera. As I won't be home to watch it live on YouTube will I be able to watch it later? Thank you so much. This is a great treat! What a wonderful opportunity to see this magnificent (and still relevant) opera performed by such a fine company! As I live in a time zone 6 hours behind London and Thursday, June 9th is an early work day, I can only hope that the YouTube broadcast will not be removed immediately following the performance (or that it will be re-broadcast during some American night or week-end). Thanks so much for getting in touch with us. I'm glad to tell you that Nabucco will be available on our YouTube channel for 30 days after the live relay, so I do hope you can catch it at some point. You can watch it from this page or on YouTube here. Unfortunately I was unable to watch the performance live on 9th June. Your email indicated that it would be possible to see it for 30 days. However I am having difficulty in accessing the opera via You Tube. I am still having difficulty in seeing this production. When I press the start icon it immediately changes to pause. Help! 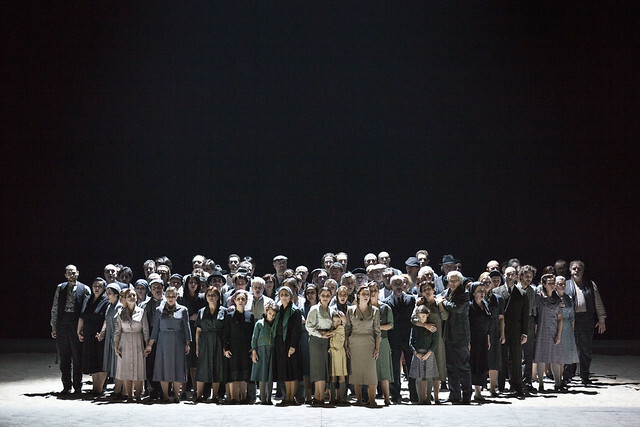 I watched Nabucco very carefully, often back-tracking to fully appreciate the artistry. The entire experience was a real pleasure. At times I wish had been present in the Covent Garden theatre; at other times I was very appreciative of the ability to see the subtlety of the facial expressions of the performers. This was also the first opera I ever saw where I knew one of the performers, at least via email. In addition to the music, action, stage setting, etc. it was thus also something of a "Chorus Line" experience. I very much hope that BP will make more ROH operas available for viewing here in the USA. I unfortunately can't access the video either. It says it is a private youtube video and I would need to sign in. Any idea how I could get access? I would love to see it. We had to update the video but the new one should now be working. Youtube link no longer working - says it is 'private'. How can I watch the full Nabucco stream please? Thanks for your comment. We had to update the video, but the stream should now be working for you. I clicked on to the link in Paul Spear (Digital Producer)'s response of 11 June 2016 at 7.21 pm and the video is still private (as at 0056hrs on 17/6/2016). It is extremely disappointing if ROH doesn't keep to its word and have the video available. When you finally get it right, please would you extend the period of time for view to compensate for the time that the video has been unavailable. Haven't had a chance to watch any of the operas that have been live-streamed since La Traviata and am happy to see you are still sharing with us - here in the colonies!!! Have watched Nabucco on n Youtube and am so looking forward to Il Trovatore next week but wondering where I find it? I am guessing it will also be on Youtube for 30 days but planning brunch on the 14th,(Western Canada!) and it's more fun to watch live stream. Please help! Thank you so much for your help - and even more, for the great gift you are giving to all of us who, for whatever reason, are not able to attend ROH. What a treat! All the best - to all the best, from Calgary, Alberta, Canada. Thank you very much, that would be much appreciated! I'm afraid it's not possible to extend the availability date for longer than 30 days.